Planning to buy a new water heater/geyser and confused with the options available and sizes available? If yes then you are not alone, there are many people who face the same situation while buying a water heater. While buying a water heater one has to make sure that it not just suffices the need of the family but also does not increase electricity bills (or units consumed) significantly. People might look at the wattage of the water heater to determine the amount of electricity the water heater might use, but wattage does not have any impact on the electricity consumption of water heater. We will try to list some facts that can help you decide on the size and type of water heater. What factors does electricity consumption of water heater/geyser depend on? Volume of Hot Water used: This is the main driving factor of electricity consumption by water heaters. 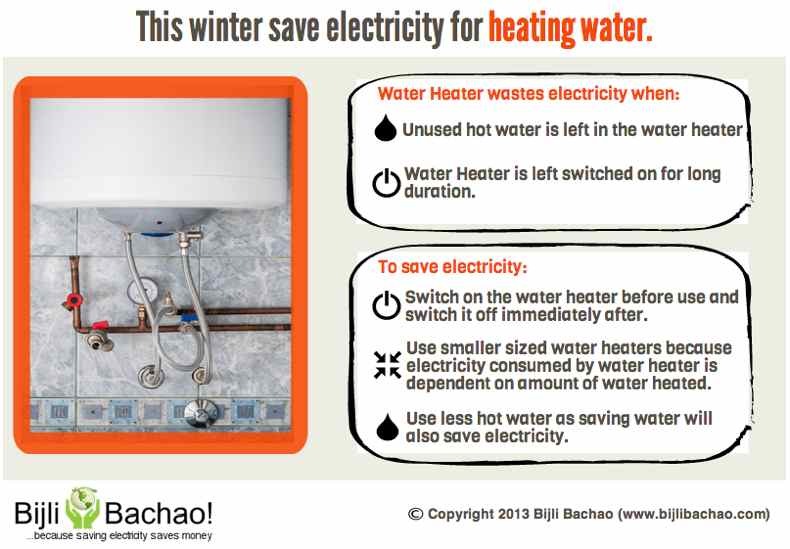 The more the hot water you use, the more the electricity it will consume. Tap (Input) water temperature: Places with colder climates need lot more heating than places with warmer climates. A water heater in Kashmir will require lot more electricity than a water heater in Tamil Nadu. Temperature of water used for bathing: Please note that this is different from thermostat temperature. Thermostat temperature: This is by default set to about 60oC for most water heaters. Some heaters have external control to change this setting. Standing Losses: Yes, water heaters do lose heat and this is calculated as standing loss. It is the heat lost through the surface of the water heater. BEE defines standing losses as the energy consumption of a filled water heater, after steady state conditions have been reached when connected to electrical supply, when no water is drawn. Much of this depends on the quality of material used for making the water heater. Branded water heaters are of better quality and thus they are preferred. BEE also rates only the branded water heaters. How much water is required for my family? For bathing using bucket water: 15 lts/person per bath (one bucket). If more buckets of water are used, then add 15 lts/bucket. For bathing using shower: 25 lts/person per bath. For tub bath or extended shower bath: 35 lts/person per bath. For washing cloths: 10 lts/person per day. For washing utensils: 5 lts/person per meal. So if there are 4 people in the household and all 4 take shower bath. Then the total hot water requirement per day of the household is 100 lts. Keep adding the water per use as per the guidelines above and you will get the water requirement of your house. What is the ideal temperature for bathing? Although most water heaters have a thermostat setting of 60oC, which means that, the water is heated up to 60oC but can human body handle water at 60oC? The answer is NO. Water at 60oC is too dangerous for human body and can cause first-degree burns. Human body temperature is 37oC and any temperature above it feels hot. A temperature of 46oC is quite hot but far less dangerous than water at 60oC. So even though your water heater heats the water to 60oC, you need to add extra cold water to make it bearable. So what is the ideal Electricity Units that are required by your family? Heat required = M (Mass of water) x Cp (Specific heat of water) x delta T (Difference in starting temperature and desired temperature). 100 x (40-20) x 0.0012 = 2.4 units per day. Will all water heaters consume ideal units of electricity? No. The amount we calculated above is the ideal units and not the actual units. The actual units depend on the size of water heater, standing losses and the way you use it. The bigger the size of a water heater higher are the standing losses, because more is the surface area. Typical 100 lts water heaters have standing losses of more than 1 unit/day, 70 lts water heater is close to 0.9 units/day, and it decreases as the size decreases. If you leave the water heater on throughout the day then you certainly loose the full standing loss units in a day. The way to minimize it is by heating the appropriate amount of water that is required which can be done by switching the water heater on before use and switch it off after use. This way the standing losses will be minimized to the period when water heater is used. Also do not waste any extra hot water because that is waste of electricity. So does it mean that you should buy smallest volume water heater? Depends. If the water heater is too small then the amount of hot water (even if it is at 60oC) will not suffice the need of single person (even after adding cold water). You will have to wait for longer for the water heater to heat the desired amount of water or keep the output flow of water from the heater low. So what is the ideal size? Ideal size of water heater should be close to the volume of hot water required at one go. If people take bath one by one and use 25 lts of water, then a 25 lts or a 15 lts of water heater will make sure that the water is optimum hot when one goes to take bath (at places where tap water temperature is not too low). If the tap water temperature is too low (especially in cold places) only a 25 lts capacity hot water will work if 25 lts of water is required for a bath. If water heater is connected to 2 bathrooms then ideal size is 25 + 25 = 50 lts, because 50 lts of water can be used simultaneously. This does not mean that 6 lts water heater will not suffice; it’s just that it will take more time to heat the same amount of water or you might have to bear with cold water at the end of your bath. Ideal sizes are those that generate enough heat that are good for maximum instantaneous use. How does the wattage of water heater effect? Wattage of water heater makes the water heat faster or slower. If you buy an instant water heater of 4.5 kW the water will heat faster than a water heater of 2 kW. At times a 4.5 kW instant water heater can also heat the water required for bathing and can save electricity (by stopping wastage of extra hot water). The only downside of 4.5 kW water heater is that it increases the electricity load of your house which means that you connected load will have to be increased which may increase the fixed charge component of your electricity bill.